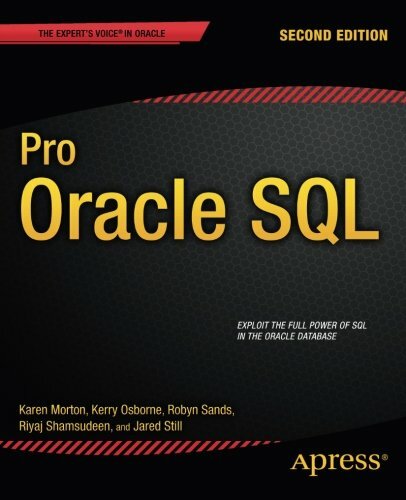 Pro Oracle SQL, Second Edition unlocks the power of SQL in the Oracle database―one of the most potent SQL implementations on the market today. To master it requires a multi-pronged approach: learn the language features, learn how and why the language features work, learn the supporting features that Oracle provides to help use the language effectively, and learn to think and work in sets. Karen Morton has updated the content for Oracle version 12c and helps you master powerful aspects of Oracle SQL from the inside-out. You’ll learn analytic functions, the MODEL clause, and advanced grouping syntax―features that will help in creating good queries for reporting and business intelligence applications. Pro Oracle SQL, Second Edition also helps you minimize parsing overhead, read execution plans, test for correct results, understand performance management, and exert control over SQL execution in your database. You’ll learn when to create indexes, how to verify that they make a difference, how to use SQL Baselines and Profiles to optimize and stabilize SQL execution plans, and much more. You’ll also understand how SQL is optimized for working in sets, and that the key to getting accurate results lies in making sure that queries ask clear and precise questions. Comprehensive―goes beyond the language with a focus on what you need to know to write successful queries and data manipulation statements. Performance focused―teaches you how to measure the performance of your SQL statements and not just the syntax.